No. Oh my goodness, no. There are a few types of SEO and they are really about how your SEO person goes about optimising your site for search. Believe me when I tell you, that you get what you pay for here, so listen up. The first type is known as Black Hat SEO. This is characterised as the use of aggressive SEO techniques, strategies and tactics. Black hat is the dark side of SEO and is a bit like black magic; instead of focusing on the human audience, it tries to “fool” the search engine into a higher rank. While it brings in a lot of traffic initially, it poses an imminent threat of being penalised by google as it does not follow guidelines. Also most black hatters will collect your money before you start to drop, so you would never suspect they had done dodgy work. Black Hat SEO is performed in a variety of ways. Some of them include keyword stuffing, where a page/ website is overloaded with popular keywords that have little to no relevance to its content, page swapping, which is changing the entire website after it has been ranked, and dodgy link backs from shifty article banks or worse, shonky business directories. Overall, practices used under this strategy is considered poor netiquette and very low brow. The aim of those using this approach is merely to get quick financial return even at the risk of being banned, although it is considered an irrelevant risk for high-return-focused sites. They are looking for an instant turnaround instead of investing in the long-term viability of the website. Nonetheless, this type of SEO is sooner or later caught, ending the streak. Another type of strategy is what is called Grey Hat SEO. It is not that much better than pure Black Hat SEO and if it was a sector of the alpha quadrant (star trek reference), it would definitely be the badlands. We say this because it dwells within the rather vague and often debatable recesses of search engine guidelines and you’re not really doing yourself any favors by using these techniques. Using it has its risks, which are somewhat lower than using Black Hat SEO, but you’re still doing business like a Ferengi if you employ a grey hatter. Grey Hat SEO isn’t seen as a safe tactic either. While it operates by exploiting unclear rules for search engines, what may be ambiguous today could become more defined tomorrow, which in effect could change your SEO categorisation to Black Hat. That being said, one needs to be watchful in implementing such techniques by staying up to date with guidelines. 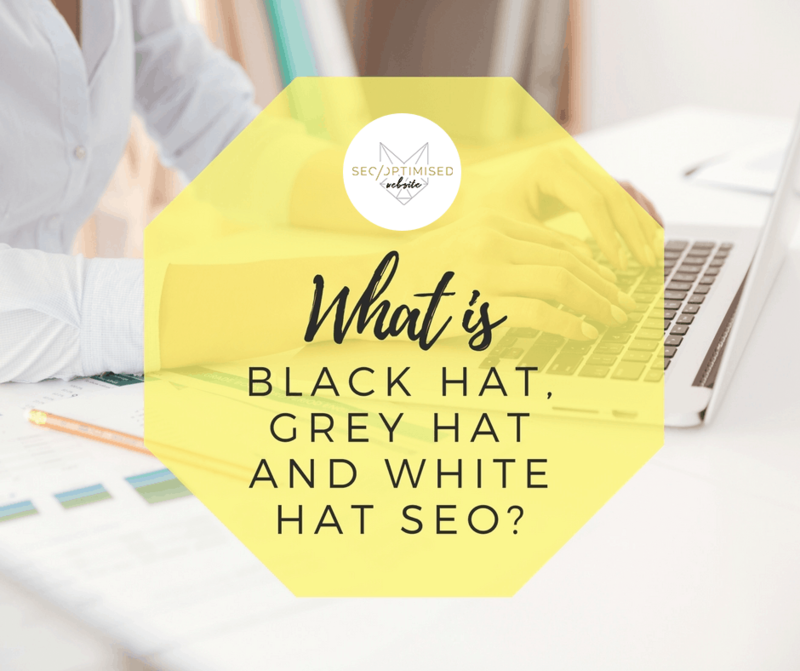 Many times website owners have had to employ us to undo their grey hat turned black optimisation which ended up costing them more than initial white hat SEO in the first place! There are many forms in which Grey Hat SEO can be seen. Some common examples are SEO squatting, redesigning a website at regular intervals, fabricating news, write negative reviews, link chaining, and content repositioning just to name a few. Like what was emphasised above, it is unclear if such practices are against guidelines now, but it may change overnight and you may find your rank dropping quickly. The last technique, and is considered to be the ideal one, is White Hat SEO. Unlike the first two, this tactic involves creating organic traffic by ensuring the quality of a web page / site. Some of the things it addresses are, but not limited to written content, images and video, meta information, site architecture, and site performance. Basically making the site make sense to people and search engines, honestly representing what is on the page and promoting it ethically online for more exposure. This is the strategy that most SEO specialists practice in order to be a cut above the rest. This ensures the longevity of the website as it stays afloat against the competition. Some of the most prominent websites on the internet make use of updated and strong white hat techniques, and are seen as useful links to the community. Given the three types of SEO tactics, it is clear what should be ethically used. Depending on the purpose and goal, however, SEO specialists may choose combinations of these. We only use white hat techniques and we specialise in organic search engine rank.